Offering four times the clarity of current Full HD TVs, 4K resolution is the next big step in the evolution of TV and promises images of astounding detail. But until the Sony PS4 turns up offering 4K gaming, is there any reason to invest in a quad HD television? 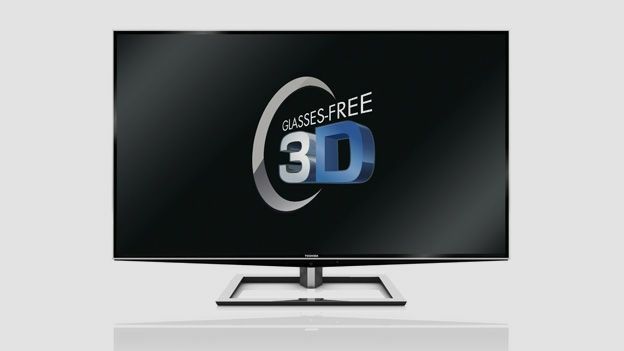 Toshiba believes there is: glasses-free 3D. The 55-inch Toshiba 55ZL2 may look much like any other 3D flatscreen, but with an ultra high resolution 3840 x 2160 panel, it leaves rivals looking like relics from the 405 line era. In terms of screen size it has no direct competitors, although the upcoming 84-inch 4K Sony KD-84X9005 at least promises to keep it company. With headline grabbing glasses-free 3D on offer, there's no doubting this set's main party trick. But it has other attractions, including USB time-shifting and streaming IPTV. Toshiba's online portal offers BBC iPlayer and YouTube, alongside a variety of subscription streaming services (but not LoveFilm or Netflix). Toshiba's up-market LED TVs rarely get the praise they deserve when it comes to design and build quality. The 55ZL2 is a characteristically splendid piece of work, but all the slick glass and metal comes at a price. At 30.5kg this is a heavy beast. Connectivity is generous. The set features four HDMI inputs, plus component, phono AV, Scart (via an adaptor), PC input, Ethernet and two USB ports. Wi-Fi is integrated. 2D image quality is excellent. Toshiba's Resolution+ processing upscales every input, including SD TV channels, to Quad HD. It does a remarkable job delivering smooth, nuanced, hi-rez pictures. The set's glasses-free 3D performance is harder to judge. The 55ZL2 uses the brand's proprietary CEVO Engine multi-core processing platform to manage the autostereoscopic process. The system works by offsetting the right eye image and filtering it through lenticular lenslets to create a sense of depth. But you need to be in an approved zone, denoted by a green 3D position arrow, for the system to work. To help line you up, facing tracking technology adjusts the zones by moving the lenslets. The catch is you can't really move your head that much once you're tuned in, for fear of phasing out of the 3D sweet spot. The sense of 3D depth isn't that pronounced either, creating quite a shallow illusion. The result is very much like looking at a static lenticular print. The set's audio performance is perfectly serviceable. A 10w woofer adds weight to the screens main stereo spread. The 55ZL2 is a groundbreaking LED TV that offers a tantalising taste of 4K resolution in the home. Upscaled 2D images look beautiful and Toshiba deserves plaudits for the technical ingenuity that's gone into its creation. However to use 4K primarily as a delivery system for glass-free 3D seems a missed opportunity. The fact that you can't input a 4K signal into the ZL2 via HDMI is a killer flaw, making the screen of little use when next generation 4K video sources come to market. Anyone buying a TV of this calibre needs the reassurance of future- proofing, and this Toshiba can't offer that.